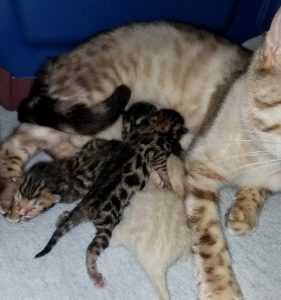 Ocelot and Ponyo babies have arrived! We have three beautiful brown rosetted girls and one seal lynx point boy. The seal lynx point boy may or may not be charcoal. We’ll be able to tell more in a few weeks. All of the kittens are doing well and Ponyo is being a very attentive mom. Previous litters between Ocelot and Ponyo have been very nice looking, sweet, and very fun little babies! Looking forward to watching them grow and change! These kittens are not yet available. Make sure you are signed up to our notification lists for updates! 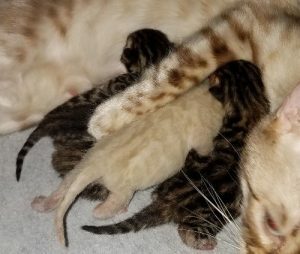 If you would like to receive updates on these kittens or any of our other Begal kittens, please sign up to be added to our newsletter and notification list. If you have any questions please feel free to contact us. 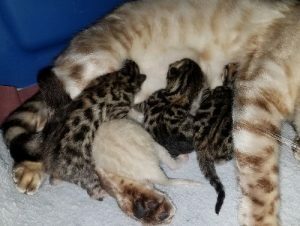 This entry was posted in Bengal Kitten Gallery and tagged bengal kittens, brown rosetted, Charcoal, Ocelot, Ponyo, Seal Lynx. Bookmark the permalink.